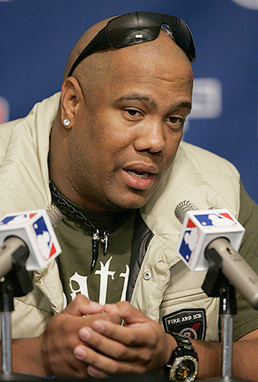 RHP Livan Hernandez and C Yorvit Torrealba have refused outright assignments to Triple-A Nashville (which is their right with their respective statuses as MLB veterans) and elected free agency. RHP Jesus Sanchez, a relief pitcher, had his contract selected from Triple-A Nashville and was thereby added to the 40-man roster. Sanchez would have been exposed in the upcoming Rule V Draft had he not been added to the 40-man roster. With these three moves, the Brewers’ 40-man roster stands at 37. Remember too that Mat Gamel and Chris Narveson will need to be reinstated from the 60-day disabled list at some point. Also, should the club decide to exercise its option on Alex Gonzalez he too would need one if those currently open spots. The Milwaukee Brewers Signed…Livan Hernandez? I’m not sitting down with an article idea to post on this. I just wanted to see the words written down so that I can stare at it and ponder what it all means. What follows might be a bit of “stream of consciousness” writing. First off, to be fair, he actually is probably an upgrade over a couple of the arms currently in the bullpen, and if he actually does only pitch out of the bullpen for the Brewers it would give them the true long-man they’ve been lacking since Chris Narveson’s injury and Marco Estrada’s subsequent move to the starting rotation. Hernandez also could almost single-handedly solve the fatigue problem the Brewers’ bullpen is currently experiencing because, to be honest, I’m not sure the man ever actually expends stamina when he throws. Sure, he exerts effort and energy, but he seemingly has the super power to absorb energy from the environment around him to maintain optimum levels in himself. He’s the “Human Gatorade”, if I may. He’s the “Ageless (Really, we have no idea how old dude actually is) Wonder”, if I may. Doesn’t “Livan” translate to “Effortless” in ancient Mayan, or something? I heard that once. I also once heard that he moves from city to city in MLB so nobody notices how he never seems to age to the point where one would normally be unable to lift their arm, let alone throw a baseball with any accuracy. Maybe he was the inspiration behind Will Smith’s titular character in the movie “Hancock”? Well, in any event, here are his career numbers for your absorption. Hernandez posses a career ERA+ of 96 (100 is league average). All of that was done for eight different franchises over 9 different stops with 10 change of address forms for his agent to send him stuff in-season during a, to this point, 17-year career in the big leagues after being signed as a free agent following his defection from Cuba. The team (along with a couple of national names) has confirmed the signing (first reported by Bill Hall on Twitter because he happened to run into Hernandez at the airport — of course he did!). Now, all we can do is ponder about the meaning of this move from a metaphysical standpoint. Oh, and we get to talk about who might be coming off the 40-man roster if Hernandez will be signed, as believed/reported, to a Major League contract. Cesar Izturis is due back from the Disabled List today, so perhaps it’s him who goes as the tandem of Cody Ransom and Edwin Maysonet have played capably. Then again, maybe the team is ready to simply cut ties with an underperforming player. Maybe with the move to first base by Corey Hart, the team feels it no longer needs to retain the services of Travis Ishikawa once he’s healthy. Maybe Marco Estrada had an as-yet-unreported setback following his rehab start last night for Nashville. The worst situation would be if something further was found in Shaun Marcum’s elbow requiring him to miss the rest of the season.